The Bagley Community Patrol is a GREAT Thing. Not only is it a way to connect with our neighbors, but it brings the area together. These residents are *TIRED* of the crime. Are YOU? Stop complaining. Take action, be a part of the solution. If you would like to make an impact, join! Make a difference! I challenge you to let the criminals know crime isn’t easy in Bagley! E-mail BagleyCommunityCouncil@Yahoo.com and we can get you involved! Below is a picture of a patrol vehicle, so you are aware of what a vehicle on patrol looks like. 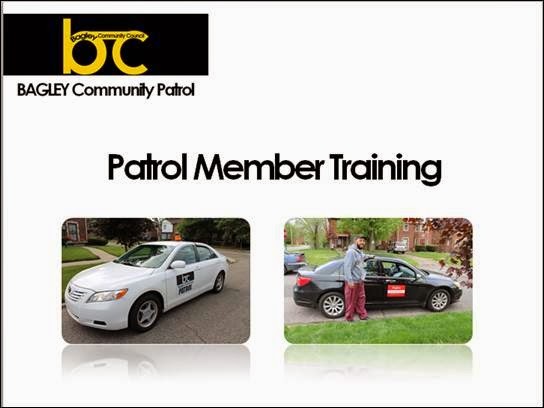 Click here to read about the positive affect the patrol is having. While you are patrolling if you see high grass, weeds, trash around a vacant home copy down the address and cross streets, please report the home 628-0918. If a house is vacant copy down the address and cross streets, please report the home 224-3215. The reports can be done anonymously. If you don’t want to report the homes yourself, leave a message on the Bagley Community hotline (313) 927-2674.